On Thanksgiving weekend Chris’s parents dropped off this old piece of furniture for me, something they’d had stored in one of their old tobacco barns for years and years. I’m hard pressed to give it a name – I have no idea precisely what you call it except that it’s likely some kind of draftsman or architect’s cabinet. Chris’s parents seemed to think it was a draftsmen’s desk but its not at all – its taller than a desk and you could never sit at it to work. I made the mistake however of not taking a picture of it before I took it apart so you’ll have to make due with this shot, of some of the drawers. I’m not too experienced with this sort of thing and I’ve been doing some searching online to try to identify the period or even what the heck it is – but so far not much luck. It may even be some kind of lawyer’s cabinet. 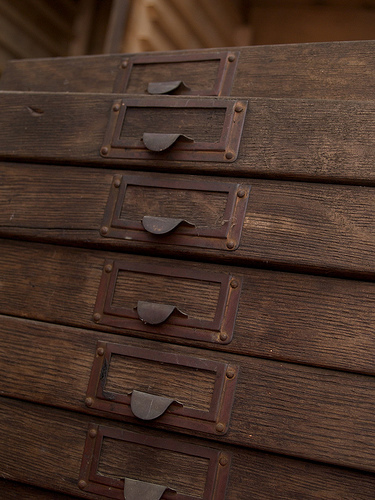 Basically it is a tall cabinet, on legs (which I’ve removed because one is about to fall apart and they need some glue and TLC), with three types of drawers – there are two large filing type drawers and then the other two types of drawers are flat, like the above photo, and have holes in the bottoms. The holes are pre-drilled, like there used to be some kind of clips or something that held the documents in place, but whatever they were they’re all missing, if there was really anything to go there at all. Each drawer seems set up to hold a regular letter-sized page, or a legal sized page, which is why I’m wondering about whether its maybe a lawyer’s cabinet. I just love the hardware on it – the drawer pulls are gorgeous. Also, it has a unique, angled top, which is why I think Chris’s folks thought it was a kind of desk. The angled top is obviously for reviewing documents, but I don’t believe it would work as a desk. As for a period – no idea. Maybe the 50’s? Who knows. Also, not sure what kind of wood it is – its very dark looking but its also very dirty. I’ve been working on cleaning it with Murphy Oil Soap, meant for cleaning furniture. It helps remove wax build up and it certainly is taking something nasty off this piece. I’m not sure if I should apply an oil or some kind of polish after I clean it. I know you’re not supposed to do much to furniture if you aren’t sure of the value, but I am going to glue this at least to try to stabilize the legs a bit. I’m happy to take any tips if anyone knows anything about furniture – I’ll endeavour to post a photo of the thing assembled as soon as I can get it cleaned and back together! I’m jealous. The wood and hardware is gorgeous! Ok I am super jealous, this is a gorgeous piece! It reminds me a bit of a blueprint cabinet, although it sounds like the drawers are a bit smaller than that. If you ever want to get rid of this let me know first!